Fraction of deaths attributable to pollution. Click for larger image. The health impacts of air pollution are well known, including increased deaths from heart disease, breathing problems, and lung cancer. Around 300 deaths a year in Bristol are linked to air pollution. Like cigarette smoking, its harmful effects have been known for a long time before enough action is taken. Parallels to secondary smoking are not far-fetched. Some people are more vulnerable to air pollution. Air pollution particularly affects the old and the young, and those with heart and lung conditions. It can lead to children growing up with smaller lungs, and exacerbates asthma. Air pollution has even been associated with changes in the brain linked to dementia. Bristol is about to tackle NO2 pollution. Nitrogen dioxide (NO2) pollution impacts on health. Pollution from NO2 comes primarily from diesel vehicles. High levels of it can inflame the airways in our lungs and, over a long period of time, affect how well our lungs work. Diesel vehicles still emit too much polluting gas – independent real-world road tests show that many diesel cars continue to pollute heavily. 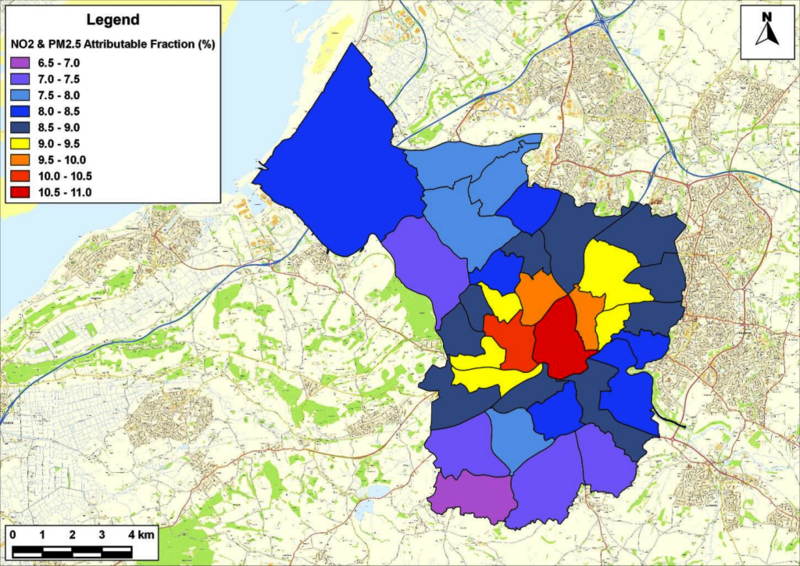 We already know where the NO2 pollution hot-spots are – the council’s network of sensors shows that hot-spots occur where traffic is congested – mostly in the city centre and on the arterial roads leading into the city centre. There are schools close to polluted roads. Bristol has to agree a Clean Air Plan by December 2018. Bristol exceeds the prescribed limits for (NO2) pollution – in the worst cases, the pollution is more than 50% higher than the limit. So the government has required the Council to come up with a plan which can be shown to get pollution within the limits in the shortest possible time. Other cities, such as Leeds, Birmingham and Bath, are also developing a Clean Air Plan. Support a Clean Air Zone! Other than a ban on diesel cars, a “charging” Clean Air Zone (a zone in which certain vehicles are charged when used in the zone) is the only measure that we can be confident will deliver cleaner air. Bristol has over the years implemented other measures to encourage a shift to alternative modes of transport, like cycle lanes, rail enhancements and Metrobus. But these measures are not enough on their own. 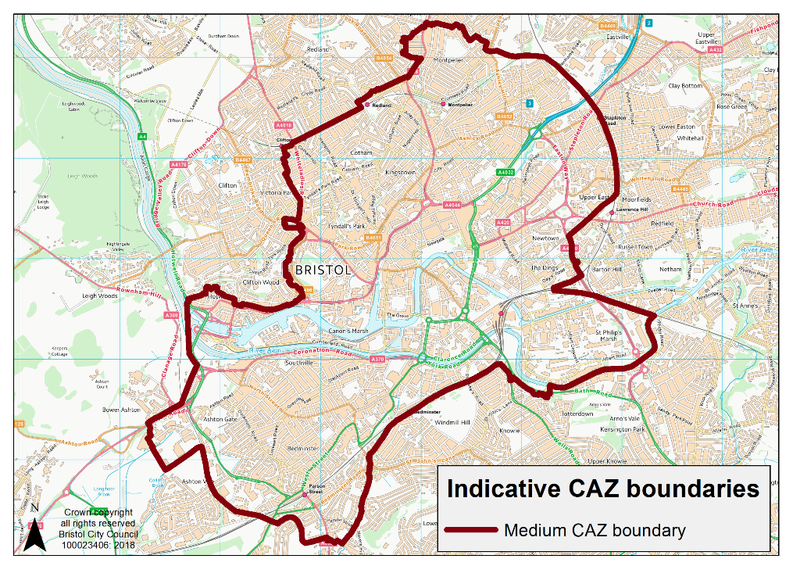 The council wants to know people’s views, especially their views on a Clean Air Zone (CAZ). People will no doubt tell the council if they are against it. They need to hear from people who support it. You can support a CAZ by going to the council’s website at cleanairforbristol.org/get-involved/ and completing the feedback form. But a CAZ is not enough. A CAZ should get us below current NO2 pollution limits, but the research evidence is that no level is safe. The CAZ charges will not affect the newest diesel vehicles even though many are still not clean. A CAZ will help, and is a prize worth having. But other measures are needed to reduce air pollution – measures that enable a shift to active travel and shared transport. It’s not just about NO2 emissions: particulates impact on health too. A ban on wood-burning stoves is needed as part of a Clean Air Act. Action is awaited from government, which is consulting on possible measures. As a cyclist who has used it and also a driver and someone who has used Bristol’s trains for daily commutes over the years, I have to say that we need to return the Bristol -Bath cycle path to a Train or Tram route. Out of the amount of people who are driving into and out of the East side of Bristol ( including Winterbourne/Frampton/Coalpit Heath/ Yate etc), many thousands could potentially take this route, therefore taking many cars off the road. While there are around an estimated 5000 trips a day on the current path, a train/tram would enable many thousands more to use it if you take into account all of the population areas it passes and the radius of walking distance to stops. It is a no brainer for me. There may be space to keep cycle/pedestrain path alongside it in places and the reduction of cars would make it safer for cyclists to use the regular roads. Rich, there are lots of possible transport initiatives like that, which could help a shift away from polluting vehicles. Only measures that can be delivered very quickly could be considered for the Clean Air Plan. 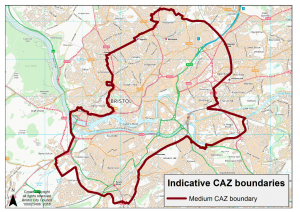 The longer-term measures are covered by the Bristol Transport Strategy – out for consultation at the time if writing. The Society will be responding. Should Bristol not become a charging city? Electric charging! I’ve heard that Bristol is not taking advantage of the government scheme to subsidise installing charging points in the city. The sooner people are encouraged into electric cars the better. Or am I missing something? Alex, Encouraging electric cars would indeed help make the air cleaner, even though tyres and brakes give rise to particulates. Reducing the volume of motor vehicles would be even better. A move to electric cars is not a measure in the short timescale of the current Clean Air Plan. The four WECA local authorities including Bristol have existing funding for charging points – see https://travelwest.info/drive/electric-vehicles/go-ultra-low-west. The point is they are not using the funding. Obviously it will take a while for electric cars to become the norm. With electric cars braking is far less of an issue as most of it is done by using the energy from moving to recharge the battery. Brake dust could be reduced ruther by training drivers to think ahead to avoid braking hard.